Trout fish farm by La Orotava Tenerife. 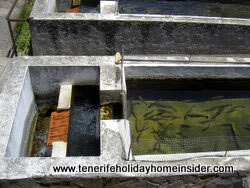 They say that the Aguamansa trout fish farm is the only one for sweet water fish in the total autonomous zone of the Canary Islands. Carretera La Orotava to Canadas del Teide at km 15. Farm project visiting hours: Every day: 10 a.m.-to 15 p.m.
General fish sale at farm Aguamsa from 10a.m.-14.p.m. Beautiful trees fence off this fish farm where water abounds. White Dalias and perfumed roses greet you by the entrance. Then thousands of agile creatures called fish make you wonder how they can live in such crowded confinement. Notice many different basins for different size trout at the farm for growing and fattening fish at Aguamansa. Trouts are predators and the young ones must be always separated from grown ones. A constantly running waterfall feeds the trout basins. The falls originate from a natural fountain supply off the Aguamansa Caldera which is further up from the trout farm. Also, discover some most delicate tiny plants which grow around this waterfall landscaping at Aguamansa whose surroundings are not only perfect for trout fish farming. Long time ago, we had a Swaziland business. Our partner had big land near the Lobombo Mozambique mountains with a huge waterfall. He was most excited about the occasional gold dust which the falling waters washed into a river. However, we gave much more value to the gushing free waters. We looked into the possibility of starting a trout farm. In the end we didn't go ahead with it. We didn't want to risk farming which needed the utmost dedication, diligence and discipline to make it successful. Our partner didn't have such qualities and we couldn't be around all the time, as we lived 8 hours away in Johannesburg. So much to a highly scientific way of growing fish, such as trouts. Trouts need fresh moving water at all times and wouldn't survive under the same conditions as Koi Carps or Goldfish, for example. Both Koi and Goldfish will be happy in relatively stagnating ponds, contrary to trouts. Meantime, it doesn't matter that many trout-fish are together in a larger basin. 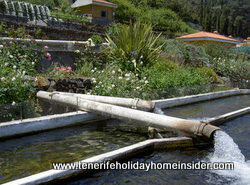 Most trout pools at this Orotava farm are quite narrow and square, while the left hand basins below the waterfall are bigger and wider. Trouts to be fattened up. Smaller trouts are kept in small basins, as depicted beside. Trout farming was introduced at the Aguamansa farm after a reforestation project was started in 1950. From then onwards, about 40 species of Cornifer needle trees were grown at this former Tenerife tree nursery by sort of an environmental working group. This department of the Tenerife government wanted to rejuvenate its forests by growing trees on the land which became a farm for fish later. Also, the production of rustic timber furniture for national recreational parks was introduced at some stage after 1950. Tree planting was the farm's main project 6 decades ago. Mind that two well known large recreational picnic-spots at Caldera Aguamansa are just up the road from this so called "fish factory" . You are not allowed to catch trouts at the Aguamansa farm, while fishing in Tenerife is leaving you so many other options, some of which entice big challenges. Sometimes, they are so thrilling that they feel like top adventure sports of the big outdoors on the island. Go to eat fresh trout nearby. You may know that a farmstead is called a finca in Tenerife. However, the Cabildo, i.e.Tenerife government named its project differently as you may have noticed earlier on. It's called fish factory Psicifactoria in Spanish. Indeed, that classifies it better than the category Fincas. 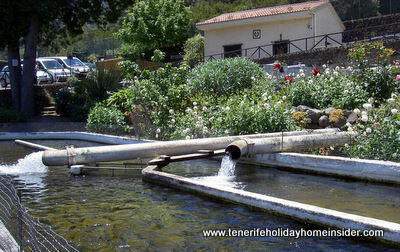 From fish farm back to fincas in tenerife.